For an added level of professionalism, you can easily set up your own branding on all Discus services and resources you need to share with others. 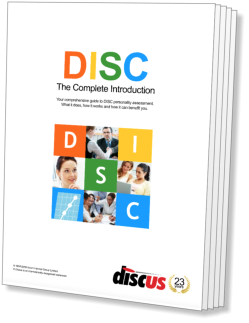 There are lots of scenarios where you'll need others to use or view Discus materials. Most obviously, and most commonly, when you invite a candidate to complete an online profile, they'll be asked to visit a part of the Discus site to answer their questionnaire. You might also, for example, want to share that candidate's personality report with colleagues, or to give them a copy of their own Feedback Report. The same level of branding can be extended throughout Discus, covering all printable material. Whether you're sharing a report with a colleague or providing a printed questionnaire, your corporate livery appears on all your Discus materials. Setting up branding within Discus couldn't be simpler. Just upload a copy of your logo and pick a colour scheme, and Discus will take care of the rest. The whole process can be set up in less than a minute. In all those cases, there's a real advantage to projecting your own corporate brand, and Discus gives you everything you need to set up your own colour scheme and logo. With branding in place, for example, when a new candidate visits the Discus site to complete their questionnaire, they'll see a portal site that matches your business' own look-and-feel. If you need a more sophisticated customisation or integration solution, we can help there, too. Discus is set up to be able to connect to other Websites and systems using its built-in Synergy interface. In practice this means that if, for example, you need to integrate DISC profiling directly into your current site, or store DISC data within your own systems, we can help. Whatever your needs, we can offer consultancy to get you up and running with exactly the solution you need. Branding Options: You can use Discus' branding options to add your own logo and colour scheme to the Discus profiling portal, used by candidates to complete online tests and optionally view reports. In addition, you can brand all printable material within the Discus system, including printed questionnaires and all reports created in PDF format. Setting Up Your Brand: Setting up your branding options is all handled through Discus itself. Just post your logo and choose your colour scheme, and you're ready to go. Advanced Integration: If you have more sophisticated needs, Discus includes advanced branding features. Using these tools it's possible to integrate the service seamlessly into your own site, and even integrate it with your database systems.